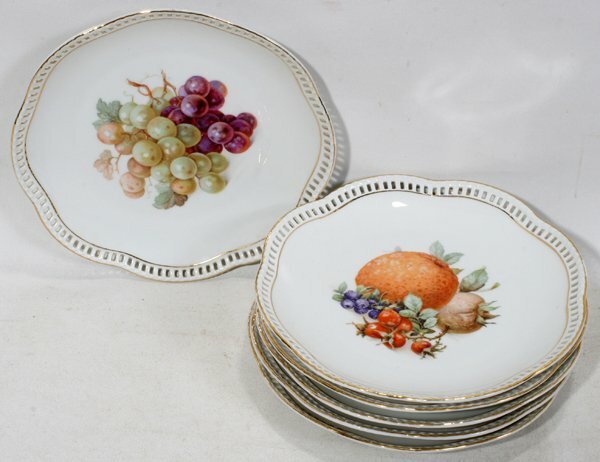 Fruit Plates with lobed, pierced rims; various fruit cluster centers. 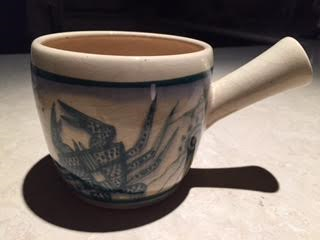 Originally from Angelroda (Thuringia) Christian Heinrich Schumann (*1822, †1884) had a small pottery in Arzberg that had to close because it was in the way of the railway which was finalized in November 1879 and connected Arzberg with the railway network. Together with businessman Riess as financial backer, Christian Heinrich Schumann founded his new porcelain factory directly under the Jakobsburg castle, next to the market square in the town center and directly next to the railway tracks responsible for the closure of his previous business. 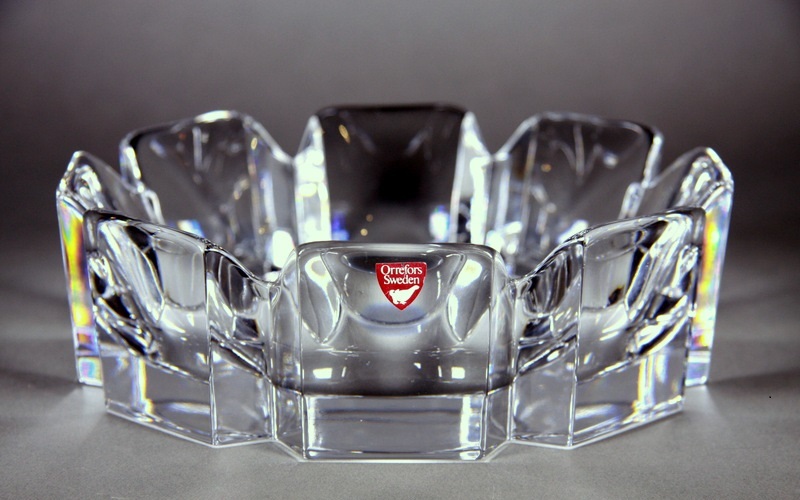 Carl Schumann II studied in America and founded the Schumann China Corporation of New York, which distributed Schumann products in the U.S. The factory was run by his brother Heinrich during his absence. While the new market in the U.S. at first seemed very promising, the world financial crisis which started in New York on October 25th 1929 put a dramatic end to nearly all Schumann export efforts. 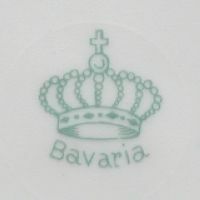 Used between 1918 and 1929, single ‘SCHUMANN’ crown with ‘BAVARIA’. 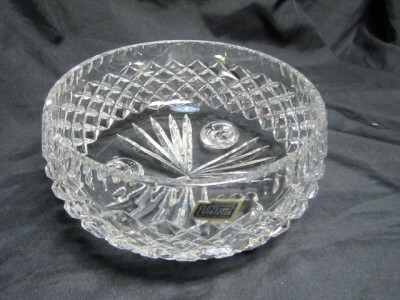 The heavy crystal circular ‘Corona’ bowl, designed by Lars Hellsten, comprising eight striking wedge shaped panels and a flat base; etched mark of Orrefors and numerals underside, with paper label. 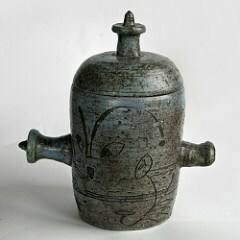 Made in 1962 by Tom Sanders, the sombre rounded form and teal colouring is enlivened by Miro like sgraffito drawings. 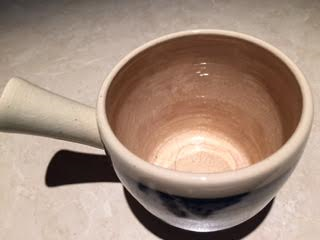 The handles suggest a function perhaps lost in the mists of time. It is a substantial piece, 30 cm high and shows in its imagination and wit the influence of his friend David Boyd, whom he regarded as pioneering some of the best pottery made in Australia. 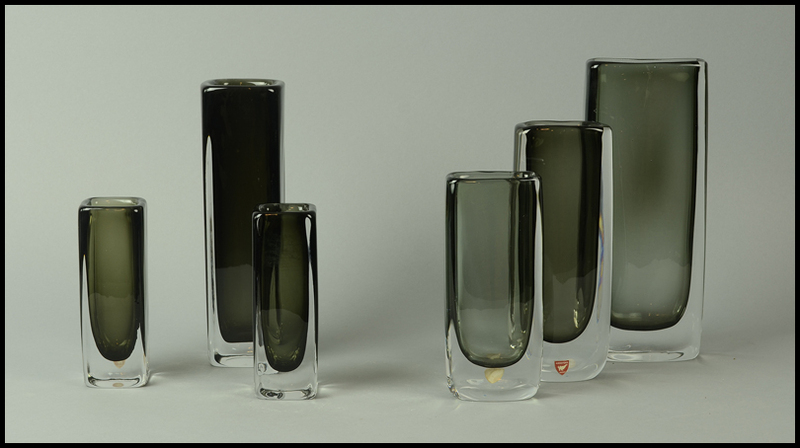 His long association with the Boyd family began in the mid-forties at the newly-set-up Arthur Merric Boyd (AMB) Pottery in Murrumbeena. Later, he was one of a number of Melbournians who turned up at the Boarding House in Neutral Bay, Sydney, where David Boyd was staying, and where Guy Boyd had set up a pottery in the backyard. 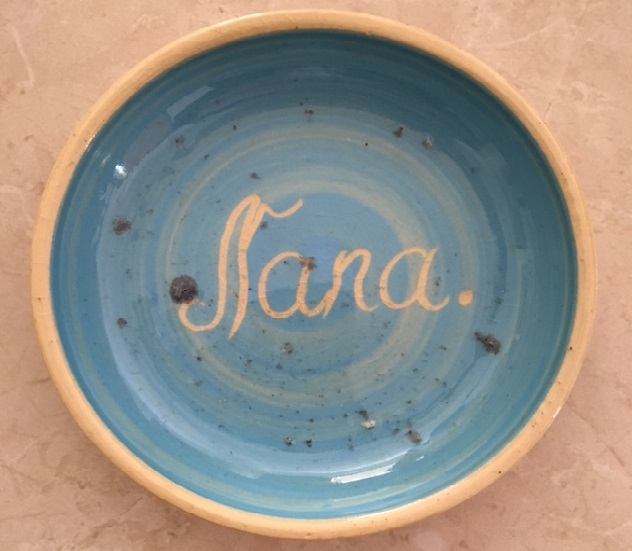 While studying sculpture at the East Sydney Technical College, Sanders worked for a time with Guy as a decorator before joining David and his new wife Hermia in Paddington to help with their ‘Hermia’ ware. Sanders returned to Melbourne in 1949. An advertisement in the Argus shows that, by the end of that year, he was selling ceramic wares through Georges Department Store under the name ‘Dorian Sands’. 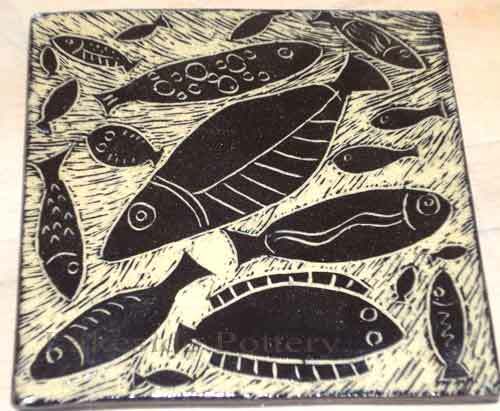 He worked at the Hoffmann pottery in East Brunswick, with John Barnard Knight in South Yarra. and with Arthur Boyd and John Perceval at the AMB pottery, before setting up his own studio with his first wife Elizabeth in Eltham in 1954. Eltham at that time was a popular retreat for artists, with a European-style colony at Montsalvat and Clifton Pugh’s Dunmoochin at nearby Cottles Bridge. Heide, home of the art patrons Sunday and John Reed, was just across the river at Bulleen. 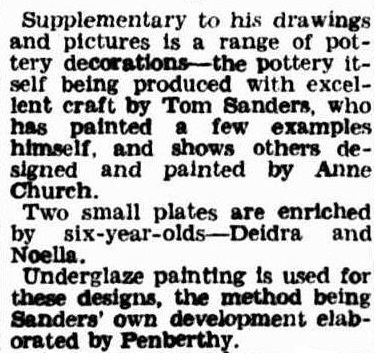 The Sanders pottery operated in a very similar way to the AMB Pottery, producing a range of commercial wares, with visiting potters, painters and friends, including Arthur and Guy Boyd, helping with the decoration. Barry Humphries opened an exhibition at Eltham and teased him about making a living from ashtrays. 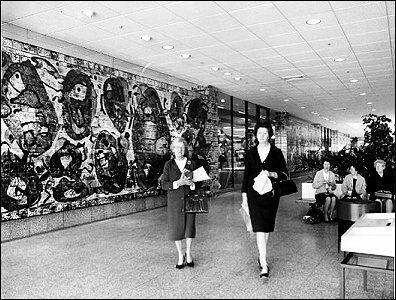 One of six murals he made in 1968 for the Southland Shopping Centre in Cheltenham, Melbourne. 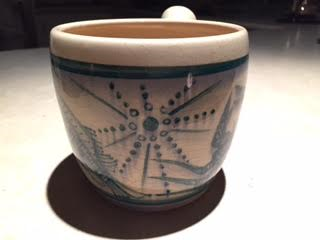 This 10 cm dish is an early ceramic work of Tom Sanders (1924-2008). Émile Zola published his novel Nana in 1880. 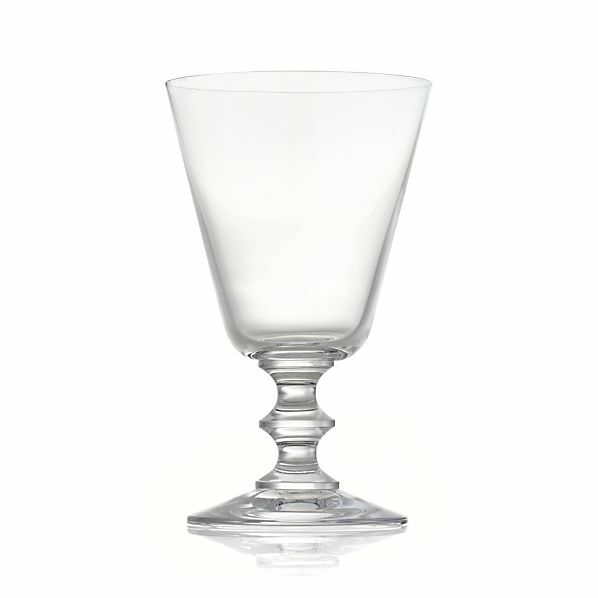 Nana opens in 1867, the year of the World Fair, when Paris, thronged by a cosmopolitan elite, was a perfect target for Zola’s scathing denunciation of hypocrisy and fin-de-siècle moral corruption. The fate of Nana, the Helen of Troy of the Second Empire, is now rendered in stylish English. Prompted by his theories of heredity and environment, Zola set out to show Nana, “the golden fly”, rising out of the underworld to the height of Parisian society. In July 1870, outside her window the crowd is madly cheering “To Berlin! To Berlin!” to greet the start of the Franco Prussian War, which will end in defeat for France and the end of the Second Empire. Niki de Saint Phalle called a series of her sculptures “Nanas”. She explained that her title evoked the prototype of the female: Eve! Aphrodite! Nana de Zola! Inusable! Increvable! (Eve! Aphrodite! Zola’s Nana! Everlasting! Indestructible!). 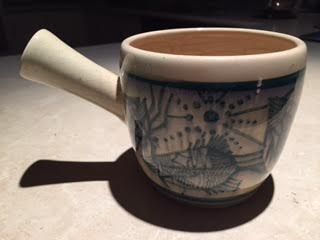 After serving in the Royal Australian Air Force as an Aircraftsman in WW2, Tom Sanders worked in Guy Boyd’s Sydney pottery as a potter and ceramic decorator. 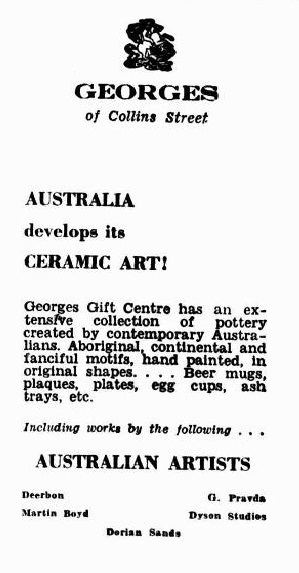 Tom moved back to Melbourne in 1949 and worked at the Hoffmann pottery in East Brunswick and with Arthur Boyd at Murrumbeena before setting up his own pottery “T & E Sanders” at Eltham. Trust yourself and build a solid connection with your team, who have all the guidance and answers! 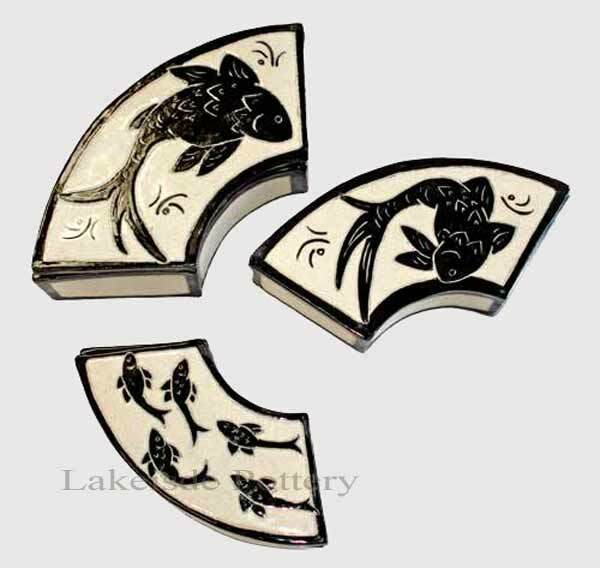 Developing your intuition in connection with your team is how you know what to do next, when to do it, and when to let go. It will always lead you down the best and easiest path. Many clients, who come to us are procrastinating, stuck in overwhelming and multiple fears, constantly looking for the magic “right way”. The most effective way any expert can make a difference is by helping you develop the trust within yourself, so you can start going up instead of constantly going sideways to the next thing or person. It is a never ending search, when you look for the answers outside of yourself. Our task is to build unwavering trust within yourself and connect you with your team, who have all the information, guidance and expertise you need to thrive and succeed easily.